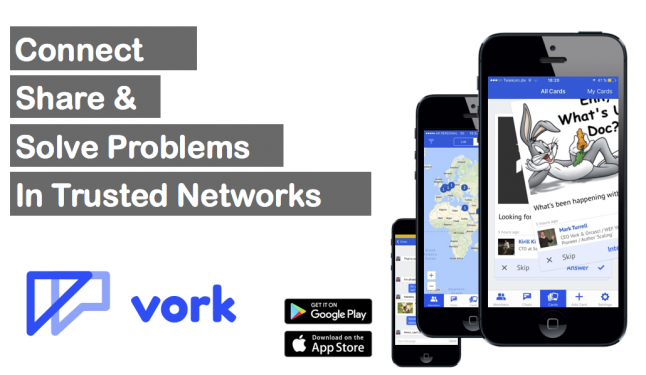 B2b mobile app for companies, associations and communities to connect, share and solve problems within their 'trusted networks'. Unique feature of the card-swipe interface ("Tinder for Networks") driven by content (not people's profiles). Members and networks owners can share problems or information in card format. Cards are tagged with a ML AI, cards are then directed to users based on tag matching AI, and each member gets a unique deck of cards each day. Swiping right (yes) starts a 1:1 chat or a group chat. Every swipe also updates the tag matching. In addition to Cards and Chat there is also a Member List and a geolocation map (for people - and soon content). The business model is monthly subscription licenses - and in future we have a platform for additional revenue streams. MVP product in App Stores end March - end April 100+ users for soft beta launch. We will roll out to large networks in mid May. We also start working on an updated UX for the app, plus developing quick-win features on the existing app. After two months we will then move to improving the core platform. Global market - though the app starts as English the content can be any language. Our first customers will be global companies and associations (e.g. international professional bodies). We will have paying and non-paying customers - paying will be companies and commercial networks (i.e. where members already pay a membership fee) - and non-paying will be NGO and other communities (help us gain reach). The enterprise social network market is growing - we believe we can carve a profitable niche as a mobile only app that is very engaging and useful to staff, whilst also handling existing content through an API (to be built - plus we need to complete a white label version as well). We operate in the enterprise social network space. Also users want to consolidate apps - so not 5 apps for 5 networks. Our app can consolidate all of them - and over time we will be able to package other apps into our containers / cards so that the user can productively spend 5 - 20 mins a day in our app - working // vorking! Chat - 1:1 and group chat. 1:1 chats also integrate the cards - so you can start a conversation from content. App is free to download and the rules on charging will depend on the networks. Company networks will be paying at $5 per member per month. Over time we will have a white label version of the app for businesses, plus we will add in Freemium features. We believe we have a unique offering through card swipe, AI, trusted networks, and integrated chat, map, search & member list all on a mobile. All the other competitors have major weaknesses in the area of connecting people together and to content. Also the founding team is already in the top networks - CEO Mark is a World Economic Forum Technology Pioneer (network of hundreds of tech companies) and Young Global Leader (1,500 top business people worldwide) and is very closely connected to the Global Shapers (7.000), Association of Association Executives (10,000 member associations), Hult Business School, etc. He is in the right networks to start with! Also two of the founders have done a successful IPO (and outperformed the market by 40% while they ran the company) - and grew the company to $7M annual revenue. Mark is also a prominent speaker - he has done 4 TEDx talks, is a Professor (only 8 day a year time commitment fortunately! ), has written a book "Scaling: Small Smart moves for Outsized Results" - and so is a requested speaker (which helps with free marketing). The collective team we have each have 20 years experience developing and selling b2b software - so we know what we are doing on the tech and business development side. We all have global experience - with focus on US, Europe and Austalia - New Zealand. Over time, our aim of $1 per person per network per month should lead to approx USD2.5M per year per 100K members. This is because individuals tend to be members of two or more networks. Users either pay indirectly (companies or network owner pays) or directly (they pay - money will go through the app store). As a founder, Mark Turrell and Dr Yvonne Lindow were nominated a Technology Pioneer by the WEF for their work on collective intelligence to create Imaginatik. The app we had then - Idea Central - was similar to the new one - apart from it was web only and much more complex! We also won a knowledge management award from the Economist, Basex Award for collaboration and we were nominated a Firestarter company.